On 1st November 2009 a new electronic publication – the SHA e~News or eNews – commenced publication, its mission to communicate timely news, announcements etc direct to members by email. Edited initially by Stuart Williams, then by Clive Davenhall, SHA e~News is currently edited by David Sellers, and is emailed to members on a quarterly basis. 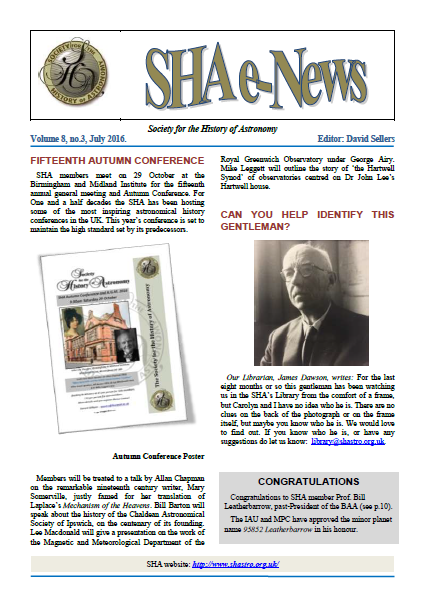 Back issues of the SHA eNews. The eNews is currently published to a quarterly schedule, appearing in February, May, August, and November each year.